In Buzz-like fashion, Google set off a backlash among some U.S. Gmail users unhappy to see a "Call dad" reminder automatically show up in their inboxes on Sunday. The search giant meant to use Father's Day as a chance to show off Gmail's built-in voice calling feature that Google launched in 2010. Instead it has sparked another embarrassing episode for Google earning it another social black eye. 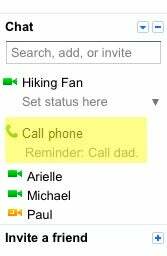 To encourage people to call their fathers, Gmail inserted a note that said, "Reminder: Call dad" underneath the "Call phone" link. But instead of creating a warm, fuzzy feeling at yet another cool Gmail feature, the company engendered ill will from people mourning the death of a parent or who have a nonexistent relationship with their father. Making the situation more problematic than it needed to be, the reminder was impossible to delete. "I don't appreciate the reminder of my unpleasant childhood and presumption that I want to speak to my father. My e-mail is not the place for this," said one user on a Google support thread complaining about the temporary feature. "I very recently lost my dad and I while I understand the sentiment, having that 'reminder' there is incredibly mocking," Google user Harpsiccord said. Despite the negative reaction to Google's reminder, other's appreciated the note. "Google is just trying to be helpful and do things that their customers might appreciate," said one user who recently lost his mother to cancer. Google may have had the best of intentions with its Father's Day reminder, but the company always seems to fail when it meddles in people's inboxes, a space many view as private. "No one's saying people shouldn't talk about Father's day, but hijacking your user's reminder lists and sticking in stuff they can't get rid of because you think it's cool is just not a very nice thing to do," said Hacker News user djcapelis. One of the great things about being a Google user is the way the company delights in surprising people with new features or quirky gifts. These can include things such as Google Doodles on its search page, the new Gmail People Widget and free Wi-Fi for the holidays. But Google should have learned after its Buzz debacle--when the company's Gmail-based social network temporarily exposed users' contacts lists--that Gmail may not be the ideal place to get personal.